The laser is capable of two different modes of operation: cutting and engraving. A single file can include either or both types of operation. In order to communicate properly with the laser we need to prepare our files in a fairly specific fashion. First we’ll go through some general information on how to get the file set up and then go into detail on how to set up your file. The laser attaches to the computer in a similar fashion to a normal printer and, as such, almost any software can send a file to the laser. That being said, we prefer to use Adobe Illustrator in order to keep things consistent. 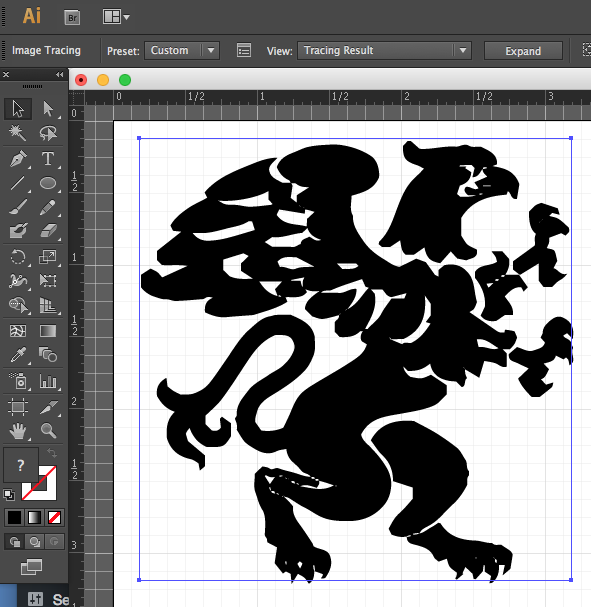 We have an Adobe Illustrator template available to download that’ll proide you with a properly sized art board (17″ x 29″, same as the laser bed) and a color palette that the laser can recognize. Note that the template is in RGB color space, the laser will not recognize files in any other color space. Once your file is complete proceed to Configuring the Laser Cutter. Use the standard drawing tools in illustrator to draw out your cut lines. 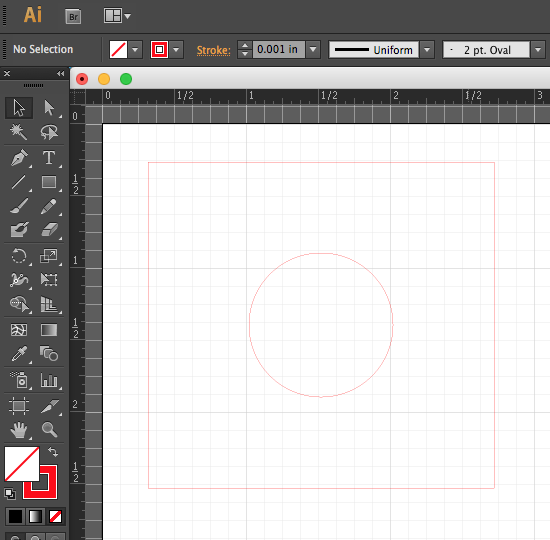 Common tools for drawing lines (Pen, Pencil, Line, Shape, etc) are shown in this CS6 toolbar menu. For the laser to recognize lines as cut lines they must be set to a stroke weight of 0.001 inches. To set the stroke weight, select your cut lines and then type 0.001 in into the stroke weight text box. If, for some reason, the box is reading in points (pt) then you may see 0.072 pt in the box afterward which is fine since that’s actually the same as 0.001 in. In addition the laser will also only recognize your cut lines if they’re the proper color. The laser color palette is embedded into the template and can be seen by clicking on either the Fill Color or Stroke Color pull-down menus. In general we use red (RGB red) for the cut lines. 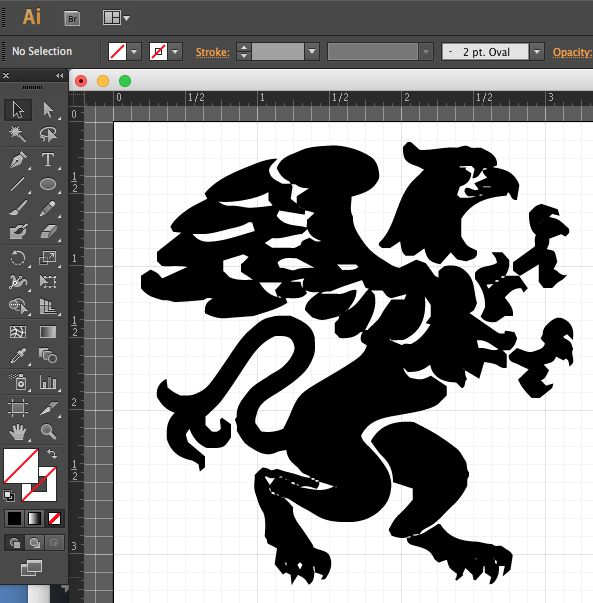 With your cut lines selected, choose the red block from the laser cutter color palette to convert your lines to red. In case some of your cut lines form a solid you’ll want to make sure that the solid doesn’t have any fill. To do that choose the red slash line on white background from the Fill Color palette (as shown in the images above). In certain situations you may want some lines to cut before others. To do this you can create a second set of cut lines making them a different color. In this case the next color the laser sees is the blue in the Laser Cutter Palette. The above file would look like this if we wanted to cut the red circle first and then the blue square after. In addition it would be possible to set different power and speed settings for each cut. Since the art board is the size of the laser bed, the laser will cut or engrave your artwork where you’ve placed it on the art board. In general, assuming your artwork is smaller than the entire laser bed, it is a good idea to place your artwork into the upper left hand corner of the template. This is the zero corner (origin) of the laser bed and it begins drawing from that point when you run you file. Given that we don’t want to cut right to the edge of the bed place the upper left hand corner of your artwork about 1/8″ (3mm) to 1/4″ (6mm) from the upper left hand corner of the ar tboard as shown in the above images. When engraving, the laser behaves much like an ink jet printer. The head moves back and forth, working its way down the image until it’s complete. Imaging is accomplished by the laser modulating the power it applies as it passes over the material, much like a printer modulates the amount of ink it puts down at a given spot to control color strength. The laser can engrave images of almost any type but it performs more consistently with vector images. This means that images like jpegs and pngs are best converted into vector files using Image Trace before sending to the laser. Not all files require tracing, some will print fine as-is so please ask if you’re not sure. 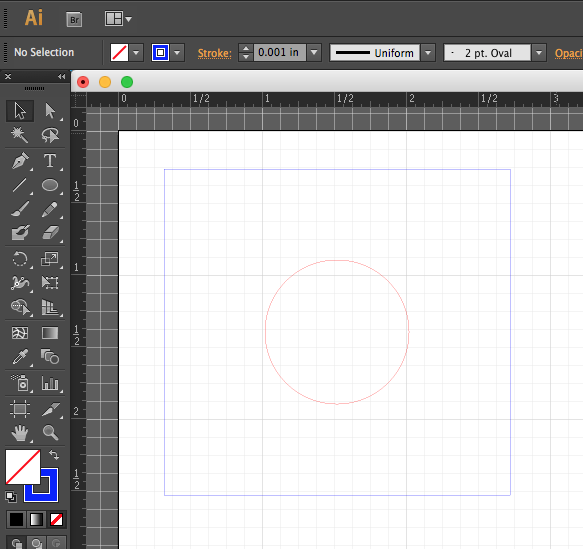 If you’re drawing your own artwork in Illustrator or just engraving text then you can skip a few steps down. If you’re using a file you downloaded or scanned then you’ll want to trace the image first. 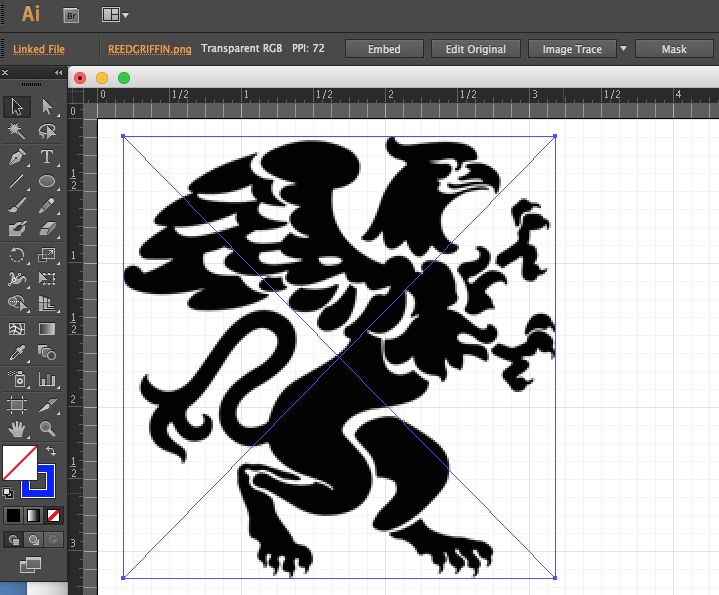 Drag and then drop your image file (assuming it’s a jpeg or some other bitmap-type file) onto the Laser Cutter Template. Click the Embed button to insert the image into your template permanently. Now we need to trace the image to vectorize it for easier engraving. With a simple image like this you can probably get away with just clicking the Image Trace button to the right of the Embed button. This applies default settings and generally works well for black and white images or logos. For more complex images, including photos, you can follow the directions found at Adobe Help. Clicking Expand will trace out paths around the solids in your file and may allow further manipulation if you’re wanting to do more with your image. If you find that your traced image doesn’t appear to have as much detail as the original then it may have to do with the size of the original image. It helps to work with the largest image you can when starting out, you can always scale it down later on. A single file can include artwork for both cutting and engraving. 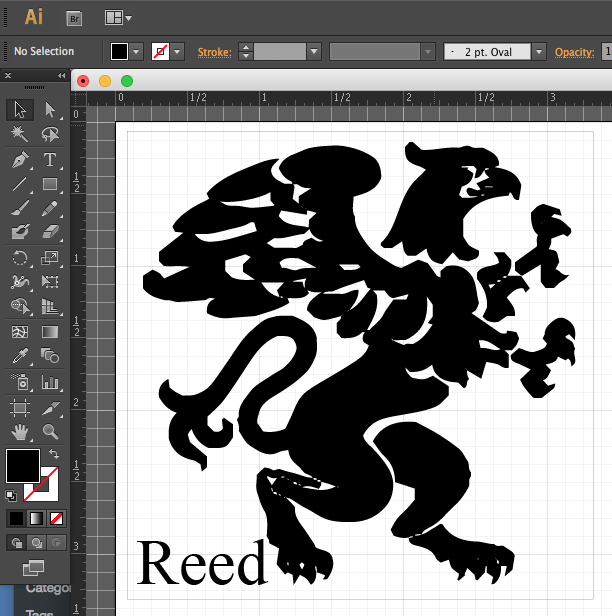 A sample file with cutting (red box) and engraving (griffin image and Reed text) might look something like this. Text is treated just like any other image, as an engraving. Since the art board is the size of the laser bed, the laser will cut or engrave your artwork where you’ve placed it on the art board. 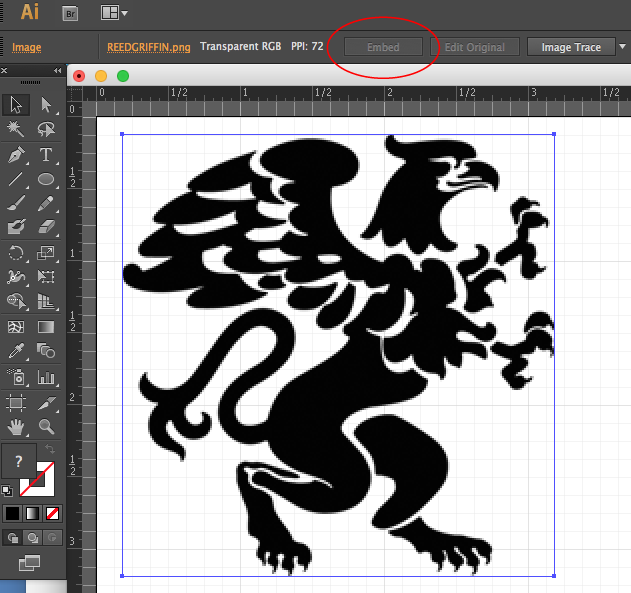 In general, assuming your artwork is smaller than the entire laser bed, it is a good idea to place your artwork into the upper left hand corner of the template. This is the zero corner (origin) of the laser bed and it begins drawing from that point when you run you file. Given that we don’t want to cut right to the edge of the bed place the upper left hand corner of your artwork about 1/8″ (3mm) to 1/4″ (6mm) from the upper left hand corner of the art board as shown in the above images.